I will admit I felt butterflies in my stomach when I saw the new Fendi Selleria Pomodorino Satchel for the first time. The reason was mostly a nostalgic one. I was excited at the prospect that Fendi MIGHT be returning to its former days of glory where chic handbag designs were the norm, not the exception. This sophisticated satchel, done in a glorious hue of metallic ancient gold, begs to be carried on a shoulder that will appreciate her clever design and curvaceous silhouette. A threaded strap and hook closure combine forces to achieve an attractive design element while the roomy 15 x 13 x 4 size provides the 'Pomodorino' its' practical side. 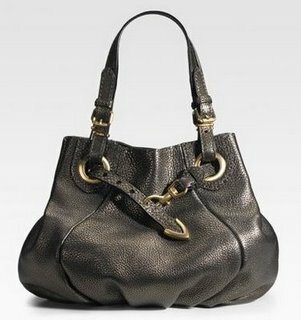 What I really like about this bag, aside from the drop-dead gorgeous color and incredible leather, is the fact that its' versatile nature will appeal to women of all ages, but is it really worth $2200? Well, I love it so much that my answer is an unequivocal "yes"! I love it. I own it in both the Ancient Gold and Lt. Silver/Pewter. It is comfortable to wear and each color is over the moon gorgeous. Plus, it wears like iron unlike many upscale bags that are either too delicate or stain too easily.